This article is about the manga. For the toy, see Beyblade (toy). Beyblade, known in Japan as Explosive Shoot Beyblade (爆転シュートベイブレード, Bakuten Shūto Beiburēdo), is a Japanese manga series written and illustrated by Takao Aoki to promote sales of spinning tops called "Beyblades" developed by Takara Tomy. Originally serialized in CoroCoro Comic from September 1999 to July 2004, the individual chapters were collected and published in 14 tankōbon by Shogakukan. The series focuses on a group of kids who form teams with which they battle one another using Beyblades. Cover of the fifth tankōbon volume featuring Tyson (center), Ray (left), Kai (top) and Max (right). The manga was licensed for English language release in North America by Viz Media. An anime adaptation, also titled Beyblade and spanning 51 episodes, aired in Japan on TV Tokyo from January 8, 2001, to December 24, 2001. The second, Beyblade V-Force, ran for another 51 episodes from January 7, 2002, until December 30, 2002. Beyblade G-Revolution, the third and final adaptation, also spanned 52 episodes (the last two episodes were released together as a double-length special in Japan) and aired from January 6, 2003, until its conclusion on December 29, 2003. Hasbro Studios and Nelvana Limited licensed the anime for an English-language release. On November 30, 2018, Discotek Media licensed the anime for SD Blu-ray releases starting with Season 1 on January 29, 2019. A young man named Tyson (Takao Kinomiya) enters the Japan Regional Beyblade Qualifying Tournament, where he encounters Ray Kon (Rei Kon) and Kai Hiwatari. After defeating them, they organize a team, known as the Bladebreakers, along with Max Tate (Max Mizuhara). Kenny tags along as their manager. The Bladebreakers tour to China to register for the championships while confronting the White Tigers, Ray's former team. It is seen that Ray's old team holds a grudge against him for leaving them. Toward the end of the Chinese tournament, Ray and his ex-teammates make amends, and the Bladebreakers win the tournament. After this, Tyson and his friends arrive in the United States to fight the All Starz, who are coached by Max's mother. After winning the American League, the team finds itself stranded in Europe. They tour Europe and meet Oliver, Enrique, Johnny and Robert, who go by the name Majestics. The Bladebreakers battle the Majestics and the Bladebreakers win the battle. They then go to Russia for the final tournament. In Russia, they meet Boris's team, of which Kai was also a member of in the past. Kai had forgotten about Boris and the training grounds where he had learned almost everything he knew about Beyblading. However, he soon regains his memory. He finds Black Dranzer, his dream Beyblade and decides to join the Demolition Boys team, aiming to be the best Beyblader. Tyson finds out and tries to convince Kai to return to the Bladebreakers, but Kai rejects him, throwing his old Beyblade, Dranzer, at Tyson's feet. Tyson keeps Dranzer with him and vows to bring Kai back. Soon, before the finals, Kai challenges the Bladebreakers to steal their Bit-Beasts and become most powerful Blader. However, only Tyson and Ray show up. Max is still at the airport, returning from where he was training with Tyson and Ray with his new Beyblade, Draciel. Just at the moment when Kai seems to take the bit-beasts of Tyson and Ray, Max comes and challenges Kai. Kai thinks that he could easily beat Draciel but he can't and soon Tyson uses Kai's own old Blade, Dranzer to beat the Black Dranzer and defeat Kai. Kai, shocked by the power of Dranzer, doesn't notice the ice beneath him cracking and falls into the frozen water below. Tyson, Ray, Max and Kenny rescue Kai. Realizing the power of friendship as well as the power of Dranzer, Kai returns to the Bladebreakers. In the final match, Tyson battles Tala, winning the match and becoming a Beyblade World Champion for the first time. The Bladebreakers have gone their separate ways. But when Team Psykick and the Saint Shields attack the Bladebreakers and try to steal their bit-beasts, the Bladebreakers reassemble to defeat the new enemies. Tyson's classmate Hilary Tachibana (Hiromi Tachibana) joins the Bladebreakers but takes time to learn that Beyblade isn't just the stupid game she thinks it is. In an attempt to steal the four bit-beasts from the Bladebreakers, Team Psykick creates four cyber bitbeast copies of the Bladebreakers' bit-beasts and recruit four skilled bladers named Kane, Salima, Goki, and Jim. These teenagers were pure-hearted and innocent bladers with high ambitions, but the dark power of the cyber bit-beasts gradually take over their minds and turn them evil. The first half of the second season ends with the Bladebreakers defeating Team Psykick. Tyson, Ray, Kai and Max battle Kane, Salima, Goki and Jim respectively and defeat them. After the cyber beasts are destroyed Team Psykick come back to their normal selves and regain consciousness. The second half of Season 2 deals with the truth of why the Saint Shields and Team Psykick are after Bladebreakers' bit-beasts and about a rock that Max's mother found that contains bit-beasts, which is stolen by Team Psykick. The Saint Shields' reason behind attempting to steal the bit-beasts is because they wish to seal them in a rock because they fear that the bit-beasts could get out of control like they did in the past. The Saint Shields battle the Bladebreakers and manage to seal off Ray's bit-beast Driger in a rock. Later Ray reclaims Driger and defeats all the Saint Shields in a team face-off. The Psykick's leader, Dr. Zagart, wants the bit-beasts to turn his android son Zeo (an exact replica of his son who died in an accident) into a real human. After defeating the Saint Shields, Tyson meets Zeo and befriends him without knowing that he is the son of Team Psykick's leader. Zeo is unaware that he is an android and that his father is behind all of Team Psykick's plans. Later Zeo finds out about his past and decides to help his father in his plans. Dr. Zagart gives Zeo a bit beast named Cerberus, the strongest bit-beast sealed in the rock. Zeo enters the world Beyblade tournament with the motive of defeating all the Bladebreakers members and stealing their bit-beasts. In the tournament, Zeo defeats Kai and Max and steals their bit-beasts Dranzer and Draciel. But in the final battle Tyson and Dragoon (Tyson's bit-beast) defeat Zeo and Cerberus. In the process, Tyson and Max's team win the world tournament. Dranzer and Draciel come back to their original bladers, Kai and Max. Kai, Ray, and Max left Tyson and went their separate ways to rejoin their old teams so that they have a chance to beat each other at the World Championship which has been re-designed with tag-teams of two. Max joins the PPB All Starz, Ray joins White Tiger X, and Kai joins the Blitzkrieg Boys. This leaves only Tyson, Hilary, and Kenny on the team. A new character, Daichi Sumeragi, and Tyson's brother, Hiro Granger, join them. The two other teams involved are the Barthez Battalion and F-Dynasty. One week after the results of the World Championships, Boris, the secondary villain from the first season, says things will return to the way they were before. But he declares that all the Beyblade shops must sell Beyblades and their parts to BEGA associated Beybladers only, otherwise they will not be allowed to run the shops. Tyson and the team find some parts at Max's father's store, which are insufficient. Then after sometime Kenny comes with the solution, he makes a new type of Beyblades known as hard metal Beyblades, using a different type of parts. But they still needed one more blader, that's when Kai, who tried to join BEGA but lost severely to Brooklyn, disbanded the Blitzkrieg Boys and rejoined the team now known as the G Revolutions. Additionally during the BEGA qualifying matches Kai's former teammates, Spencer and Bryan of the Blitzkrieg Boys defeat a BEGA Training squad but lose easily to a mysterious blader known as Garland Siebald. Tala, the leader of the Blitzkrieg Boys who was previously the final boss in season 1, takes on Garland but lost the match and was seriously injured after Garland activated his attack, Radiant Thunder and ended the match. Daichi and Ray lose the first two matches to Ming-Ming and Crusher only proving that their hard metal blades were also no match for their powerful blades. Max ends the third match with Mystel in a draw. Then it is Kai's turn to face the unbeaten Brooklyn. Kai defeats Brooklyn in a match. Then Tyson beats Garland. Brooklyn becomes insane due to his loss to Kai and confronts Tyson. In the ensuing match, Tyson and Brooklyn battle it out in the tie-breaker match. As the final fight rages on, Tyson is able to absorb the powers of every single bit-beast and with a final attack defeats Brooklyn's, Beyblade Zeus. And the BEGA corporation had fallen thanks to the efforts of the Bladebreakers (G-Revolutions). The episode ends with Tyson and Kai to have one final match. In the Japanese version, the episode ends with a special ending showing every major character from the series. Tyson and Kai battle one last time before Kai goes to London with Tyson releasing his storm but that didn't work on Kai and the match ends with Tyson being defeated. Meanwhile, Ray wins a regional tournament but isn't happy that Tyson hasn't participated. Kai returns to Japan after completing his studies. Tyson comes to know about this and tries to meet Kai, but when he reaches there he finds that Kai has left beyblading and is now controlling his grandfather's company. Tyson is shocked to hear this. He understands that Kai is abandoning his passion just to keep his grandpa, Voltaire's will. Tyson makes Kai understand and listen to his inner voice. Voltaire at last understands his mistake and allows Kai to carry on his journey. Tyson challenges Kai for a beybattle. Kai is about to be defeated when he uses his beyblading skills and defeats Tyson. Tyson and others are shocked but he is glad to find his friend back to action. 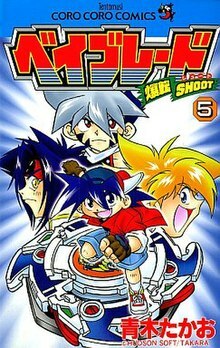 The chapters of the Beyblade manga were written and illustrated by Takao Aoki. It was serialized in CoroCoro Comic from 2000 to 2004. The manga was licensed for an English-language release by Viz Media. In 2016 Takao Aoki released a sequel manga to G-Revolution called 'Beyblade: Rising' featuring the original characters, which is currently ongoing. There are currently four volumes, with the fifth being released in Japan in September 2017. A three-season anime television adaptation was adapted from the series. The first season, spanning 51 episodes, was produced by Madhouse and aired in Japan on TV Tokyo from January 8, 2001, to December 24, 2001. The second season, produced by Nihon Animedia and titled Beyblade V-Force, ran for another 51 episodes from January 7, 2002, until December 30, 2002. The third season, Beyblade G-Revolution was also produced by Nihon Animedia. It spanned 52 episodes and ran from January 6, 2003, until its conclusion on December 29, 2003. All three seasons were licensed for English adaptation, broadcast, and release in North America by Hasbro Studios and Nelvana Limited, where it aired on FOX Kids. But it got cancelled to make way for FoxBox, then it was broadcast on ABC Family's unnamed pre-JETIX-era action-oriented programming kids' morning block in 2002. It also aired on Toon Disney's action late-night/primetime children's programming block, JETIX in 2004 until 2009. The first season was released by Pioneer, who was later named Geneon, and then Cinedigm, all for the first season, and then Funimation for the third season. The license for the all three seasons were transferred to Discotek Media for SD-BD releases on January 29, February 26, and March 26, 2019, respectively. Another Beyblade anime series entitled Metal Fight Beyblade was produced by Tatsunoko and SynergySP, and is based on the aforementioned Metal Fight Beyblade manga. It premiered on April 5, 2009. Nelvana has licensed the series, which was released in North America as Beyblade: Metal Fusion. It premiered on Cartoon Network in June 2010 with showings on Saturdays and Sundays, and has lasted four seasons, including Metal Fusion, Metal Masters, Metal Fury, and Shogun Steel. A new Beyblade series is undergoing release named Beyblade Burst. Beyblade inspired two spin-off series: BeyWheelz and BeyWarriors. Two theatrical films based on the Beyblade series were produced: Beyblade: Fierce Battle was released in 2004 and Beyblade: Sol Blaze, the Scorching Hot Invader was released in 2010. In May 2015, Deadline Hollywood announced that Paramount Pictures had acquired the rights to turn it into a live action film after the success of Transformers and G.I. Joe all of which are owned by Hasbro and released through Paramount. The film will be produced by Mary Parent through her Disruption Entertainment banner. Beyblade developed a cult following when the series' popular spinning top toy was launched worldwide. Now with the released fourth season of the Metal Fight Beyblade series, Metal Fight Beyblade Zero-G, aka Beyblade Shogun Steel, a toy line which consists of Beyblades from the anime including Samurai Ifraid W145CF, MSF Shinobi Saramanda SW145SD, MSF Pirates Orojya 145D, Thief Phoenix E230GCF, Guardian Reviser 160SB, MSF Archer Gryph C145S, Pirates Killerken A230JSB, and many more are being released in Asia. Beyblade, Let It Rip! The Official Album was released in the UK to coincide with the show's popularity. It featured the anime's opening theme, as well as songs by artists including Nickelback and Busted. Originally developed and manufactured by Takara Tomy, first released in 2000. The toys include a 'launcher' – a device for bringing the spinning top up to speed in a plastic arena known as a Beystadium, with a slightly dished base, where they subsequently strike each other. The last top still spinning wins. Beyblade is largely a game of power and angle, although many players believe a particular launch style can influence the outcome of a game. Common Sense Media described the series as a "formulaic toy-inspired series [that] has some good messages." Don Houston of DVD Talk wrote, "The show is just one long repetitive commercial, and not a well made commercial at that." ^ Ressler, Karen (February 18, 2016). "Hasbro, Sunrights Plan International Launch of Beyblade Burst Toys anime". Anime News Network. Retrieved March 8, 2019. ^ Ressler, Karen (November 30, 2018). "Discotek Licenses Beyblade, Shin Tetsujin 28 Anime". Anime News Network. Retrieved December 1, 2018. ^ Ressler, Karen (December 20, 2018). "Discotek Media Licences Inukami!, Twilight of the Cockroaches, Beyblade V-Force Anime". Anime News Network. Retrieved April 7, 2019. ^ Ressler, Karen (January 21, 2019). "Discotek to Release Beyblade G Revolution Anime, X-Bomber Puppet Series". Anime News Network. Retrieved April 7, 2019. ^ "あにてれ：メタルファイト　ベイブレード　４D". tv-tokyo.co.jp. Retrieved 18 April 2015. ^ "AWN Headline News". Animation World Network. Archived from the original on 3 September 2009. Retrieved 18 April 2015. ^ Anthony D'Alessandro and Anita Busch (May 27, 2015). "Paramount, Mary Parent To Turn 'Beyblade' Into Live Action Feature". (Penske Media Corporation). Retrieved May 28, 2015. ^ "Beyblade". commonsensemedia.org. Archived from the original on August 27, 2013. Retrieved 18 April 2015. ^ "Beyblade — Hidden Tiger (Vol. 3) : DVD Talk Review of the DVD Video". Dvdtalk.com. Archived from the original on November 1, 2014. Retrieved 2012-06-16.